NASA's Chandra X-ray Observatory has observed an unusual galaxy cluster that contains a bright core of relatively cool gas surrounding a quasar called 3C 186. This is the most distant such object yet observed. A space telescope has spotted astrange, distant galaxycluster with a cosmic heart that is surprisingly cold. Quasars form at the central regionsof some galaxies, where giantblack holes gobble up matter so furiously that the remainingstuff aroundthem generates tremendous energy transmissions that span the entireelectromagneticspectrum, including radio waves, light and X-rays. They are some of thebrightest objects in the universe. But the heart of the galaxy clusterstudied by the Chandraobservatory is only cold in astronomical terms. The gas at the cluster's center is amere 30 million degreesFahrenheit (16.7 million degrees Celsius), while stuff at the outskirtstopsout around 80 million degrees Fahrenheit (44.4 million Celsius). Whilethatseems scorching hot to the average human, for quasars it's positivelychilly,researchers said. This drop in temperature occursbecause intense X-rayemission from the gas nearer the core cools it down, the researchersadded. The galaxy cluster surrounding quasar3C 186 is the mostdistant one ever found containing a quasar.It's also the most distant cluster ever observed with a cooling core.Thefaraway object could therefore provide insight into how quasars formandclusters grow, researchers said. Because it took 8 billion years forthe cluster's light toreach Chandra's instruments, researchers are seeing it as it appearedwhen theuniverse was still relatively young ? less than half its current age ofabout 13.7billion years. Previous observations have revealedlarge numbers ofclusters with strong cooling cores closer to Earth, less than about 6billionlight-years. But they appear to be more rare the farther awayresearchers look. One reason for this may be that moredistant galaxyclusters ? which are younger, since astronomers are seeingthem at anearlier point in the universe's history ? merge more often with otherclustersor galaxies, researchers said. These mergers would destroy thecooling cores. When coupledwith the fact that it takes cooling cores a long time to form, thiswould makethem rare in the earlier stages of the universe. 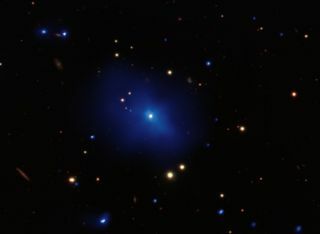 This cluster was found fortuitouslyvia a relatively modestChandra survey. So it's possible that many other similar objects existat largedistances, researchers said. The picture of the clustersurrounding quasar 3C 186 is acomposite. It includes a new image from Chandra showing X-ray emissionsfromgas surrounding the point-like quasar near the center. Optical datafrom theGemini telescope in Chile contribute views of nearby stars and galaxies. The research is detailed in the Oct.10 issue of theAstrophysical Journal.